The random number generator has spoken....here are 8 winners. 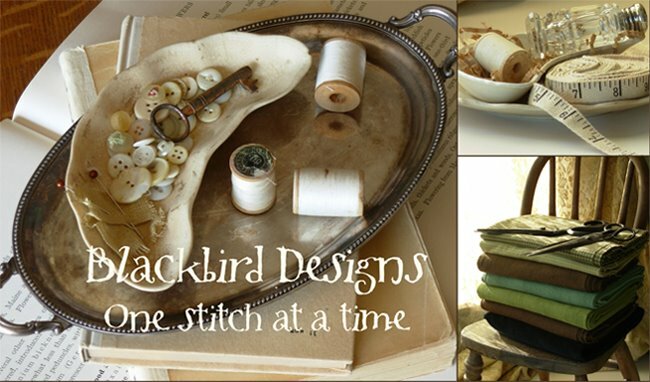 E-mail me ... alma@blackbird-designs.com and let me know your address so I can ship out the fabric packs. Congratulations!!! 1. #36 Leslie Allen said...Now, I would LOVE to collect Pink Hill manor, but since finding your blog, I've ventured off to your quilts (after a 7 year hiatus in quilting), even though and I'm two years behind with Loose Feathers' club too! Talk about a wealth of choice! I'm trying very hard to resist, but it may be fruitless! Thanks so much for your wonderful inspirations! 2. #49 Kim said...Your new book looks wonderful and I love the new house! Beautiful as always!3. 3. #94 Carmen Sutton & Jean Hohulin said...Can't wait to see your new book in person. It is amazing all the you two get done. 5. #146 Berit said.."Anniversaries" is moving right along!Thanks for offering a fun fabric giveaway; please include me in the draw! 6. #379 edie said...Can't wait to get the new book, new chart, and . . . my local stitchery shop's order for the linen has been on back order FOREVER, and it looks like we have another five weeks to wait. BOO!!! Patience. You all two are so talented. How do you do all you do, AND just keep coming up with wonderful things. Counting the days until Boxwood and Berries! Is it possible to bribe the random number generator? 7. #434 Emma said...Can't wait to get my hands on Country Inn. Right now I'm finishing your latest freebie Done My ABCs. Love your sweetness and generosity. I have a dish thing going.....as you can tell from the photography above and below. I love plates that have pink floral designs along the outside rim of the plate. While at the beach I found these plates at a local antique shop. I picked these up so we could eat in style out in the screened-in porch. The chips and cracks don't bother me too much. I love the sweet look of the plates....and I love the smaller size too! Helps with smaller portions and still looks like your plate is full. The wine glasses were a find too. But the man helping me at the antique mall in Robertsdale, AL, looked at me and said, "Sounds like fun. Wish I could come too." I just love the simple beauty of them!!! 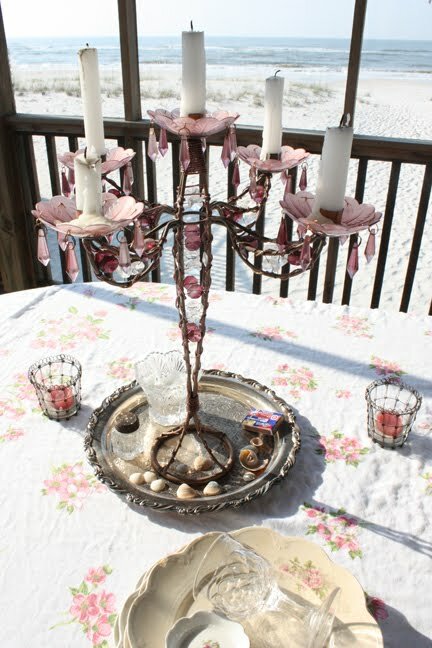 Wishing you all great vintage finds and friends and family to enjoy them with! 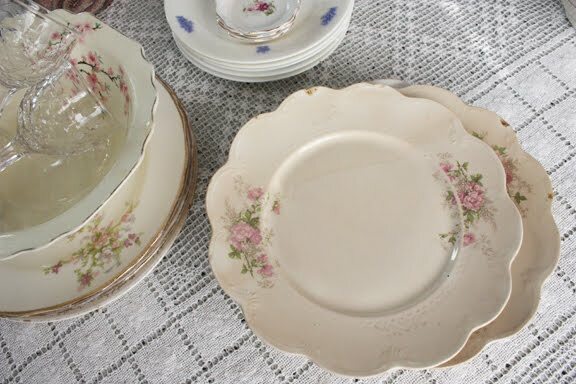 Lovely china or dishes are such a nice thing to have. Use them and enjoy them-that is my motto. I have a few sets but it is nice just to have a few items for when I do not want to drag all of it out. The mix and match patchwork dishes look lovely. 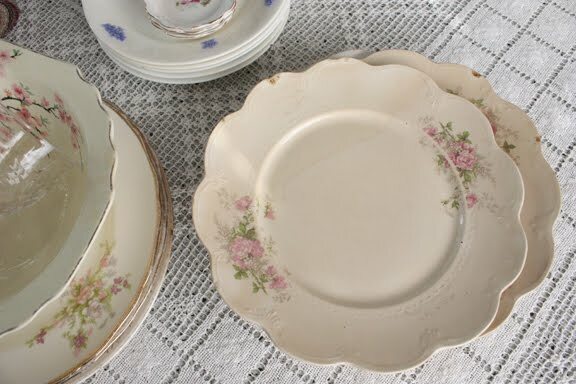 My mother broke a lot of dishes and had one teaset made up of the remains of several others, every piece different, which she called her 'harlequin set'! She also regularly carried a cup in her handbag so she could try to match any nice dishes she saw. Looking forward to the new publications. Just my luck! I was away and missed the give away. Love everything you do, even the chipped dishes. I can see my fabric stash will get a little bigger with Garden Party and my book shelf fuller with Country Inn. I will need a bigger house soon. Can't make up my mind if I like quilting or cross stiching the best. your dishes are so lovely! 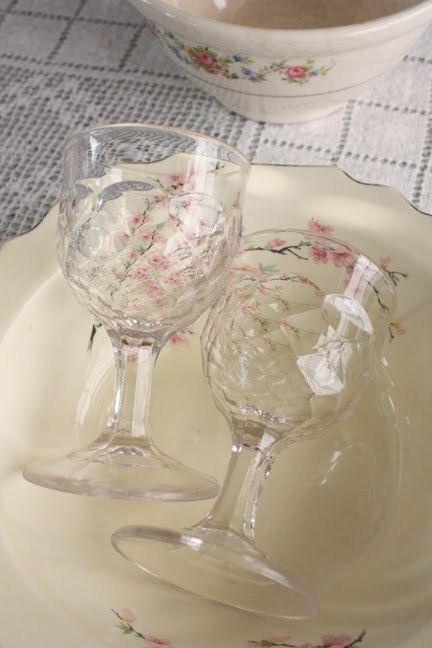 they remind me of my mother's first set of dishes, which also had pink rosebuds around the rim. Congrats to all the winners!! Better luck next time to the rest of us! I love your collection of plates! Can I come for dinner too? Congrats to all the winners! I love all your vintage china. Congrats to the winners, you lucky ducks! When my cousin got married, she registed for one set of 8 different place settings. Her reasoning was that she loved the variety and if something broke, she could replace it with a different setting - no searching for a specific pattern! I thought it was brilliant. Congratulations to all the winners. Look forward to you sharing how you finish your stitiching pieces from the book. I love to do the dish thing, too. My problem is no good way to keep them accessable. My fantasy is a big pantry where I can line dishes up and use play with them at every meal.Guess I never outgrew tea parties! Never listen to anyone, but your own heart, especially those who believe in having a complete set. Your dishes are beautiful. Enjoy them. 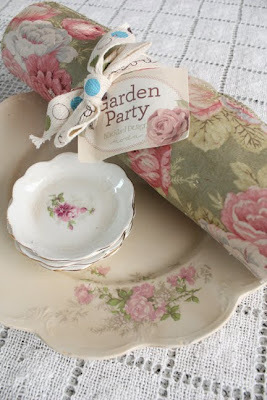 Congratulations to the garden party winners...but aren't we all when you consider the beautiful photos and lovely sentiments in your blog posts?! Congratulations all you winners! Guess I'm going to have to make a trip to the fabric store for some "Garden Party"
I have been reading some of your older posts, so please understand why this message doesn't fit your present blog. I read where you told us about your son having a mental illness. I am so happy to hear you speak openly about him. My youngest son developed a mental illness in his twenties and unfortunalely it wasn't so obvious to me or his friends. He took his own life 10 years ago. Every year I walk 20 miles in the Out of Darkness Overnight walk sponsored by The American Foundation for Suicide Prevention, which works to help those with mental illness. I am proud to say I have raised over $50,000 doing this walk. I will think of you and your son this June as I walk through the night to bring mental illness and suicide into the light. I can't believe my luck. I won these beautiful fabrics. Have to think of a nice project to use them now. Maybe with some stitching too? Love the dish pics! I, too, like the old dishes with the pink flowers. And like Alice R., I would love to have a pantry where all the great dishes are visible and ready for use. Thanks for continuing to share all your wonderful ideas! Some of those plates look similar to the ones that I have. I especially am attracted to butter pats and have found quite a few. My Mother and I would go antiqueing and found lots of good treasures. She has now passed on but it is such a good memory of her. My heart goes out to you. I tried to find your e-mail address to send this to you....but it wasn't listed...I'm sorry to respond in such a public way. I'm very sorry for your loss. My son's mental illness also developed when he turned 21. I'm grateful for your kind thoughts during your walk in June. I haven't heard of this fund raising walk ...but will look it up. What a wonderful way to contribute to your son's memory. $50,000 is quite a large contribution and leaves a legacy to help others. My thoughts are with you also as you volunteer during June. A woman after my own heart. I love old dishes with pink flowers. 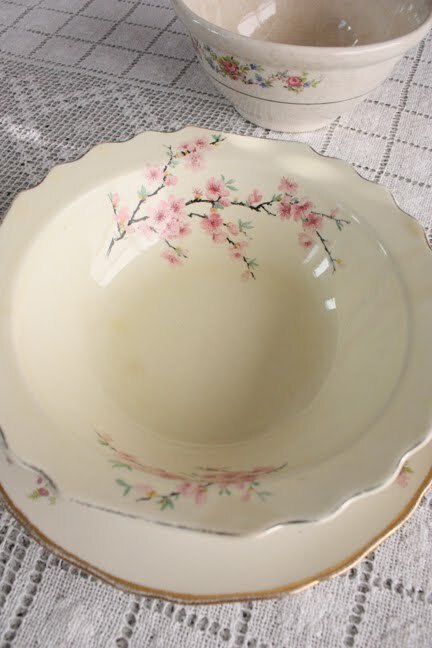 I spied the very same bowl the one with the flowers on the branches a couple of weeks ago at the good will store. Decided that I really didn't NEED another bowl and walked out of the store without it. Now seeing yours so pretty on the table I am having a sad moment wishing I would have just bought it. When something calls your name you need to buy it...I know next time I will not have a second thought! Dinner by the sea sounds lovely! 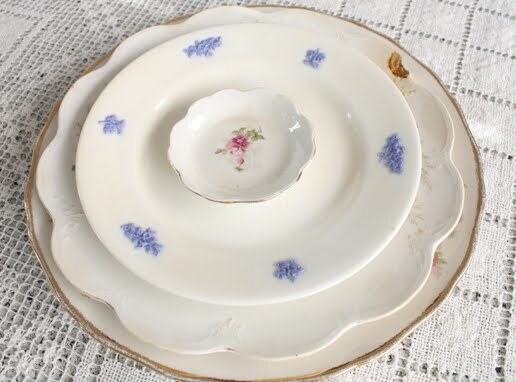 Thank you for sharing even the slight imperfections and giving me a new perspective when I see a chipped dish....It just needs someone to love it just like all the others. Love the Pink Maison stitchery and your beautiful fabric. Thanks for sharing. Blessings to your day!